1 Reception hosted by Citibank. The tour happened less than a year after 9/11 when memories of the attack on the World Trade Towers were still fresh in minds of people around the world. 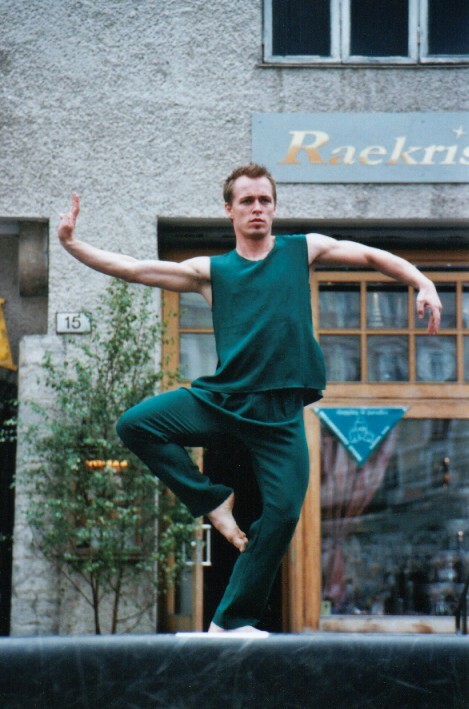 The fact that BDC was a lower Manhattan dance company, located blocks from Ground Zero, was not lost on Swedes. It was regarded as a very touching and vivid demonstration of the resiliency of Americans in the post-trauma context that Battery Dance Company was out on the road, performing and bringing its artistry to public audiences. Stockholm was celebrating its 750th anniversary and there were tremendous, city-wide events going on. 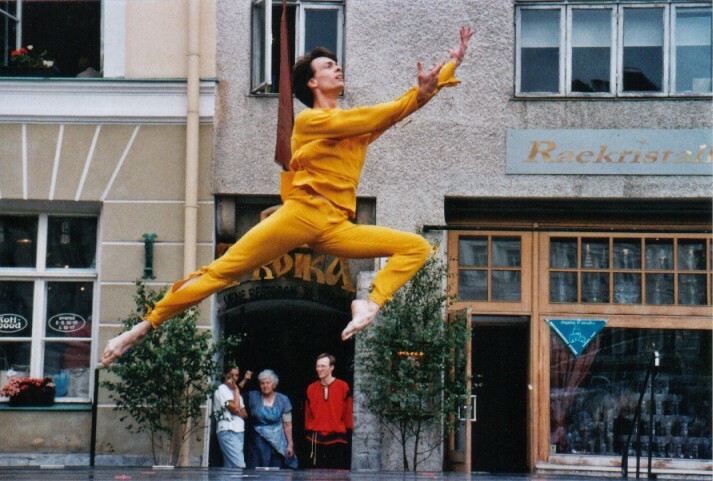 Battery Dance Company performed in large, public performances that were part of the formal program of Stockholm 750 and were therefore more broadly publicized than would otherwise have been possible. BDC benefited from the fact that a dancer from the Royal Swedish Ballet, Mariella Rietschel, had joined BDC for a 3-year posting during a sabbatical from the Stockholm company. Having a Swedish 'star' in the company, who was then invited to be a featured performer for Stockholm 750, added even more lustre to an already lustrous tour. BDC had experienced a very successful partnership with Citibank in Finland in 2000. Through the Helsinki office, contact was made with the Stockholm colleagues who agreed to serve as the prime sponsor for BDC's tour. Citibank needed a focus for its support of Stockholm 750 and as an American bank, they embraced the opportunity to join with the US Embassy, whose Ambassador opened his residence for a very upscale reception in which Citibank was invited to participate. Ogilvy also joined in, having worked with BDC previously in India -- and with this strong team of corporate and government sponsors, working in perfect harmony, and the cooperation of the weather (perfect sunshine), the entire event was a huge success. Magnificent weather, hospitable Swedish audiences, and a feeling of elation at the unexpectedly grand success of its first stop on the Company’s Baltic Tour, all produced a determination among Battery’s Dancers. They want Stockholm to be a regular stop on their international itinerary. 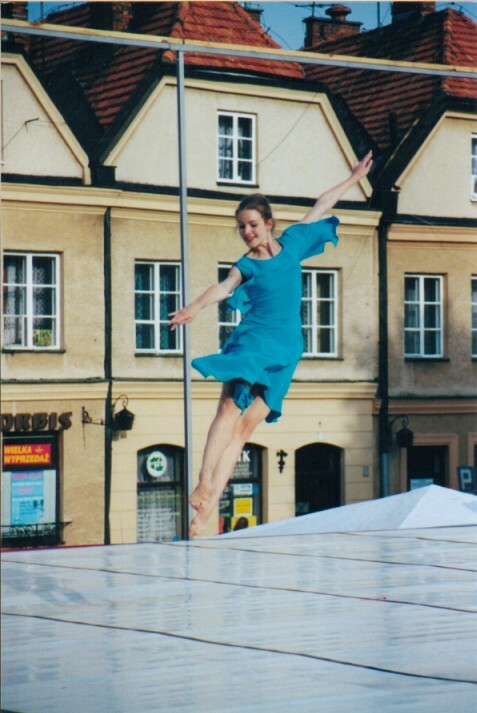 On the first day of the tour to Stockholm, Battery’s Swedish dancer Mariella Rietschel ascended to a height of 18 feet, atop the towering Festival stage at the “King’s Garden”. She danced silhouetted against the sky overlooking Stockholm’s palace and harbor, as a featured Stockholm personality of the City’s 750th Anniversary. Following her solo performance, choreographed especially with the vertiginous platform in mind by Jonathan, Mariella (attended to by her own private fireman), lit the fuse that set off a glorious series of fireworks. This was a big night for BDC, as it was reported that a 10,000-person audience tally may in fact be an understatement! 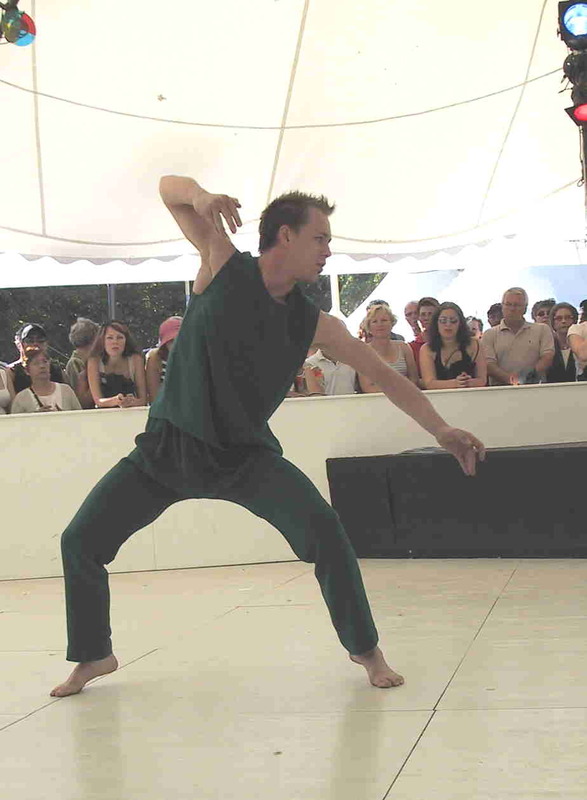 On the second day of the Stockholm 750 festival, Battery Dance Company presented an outdoor concert on the huge stage at Skeppsholmen, an island in central Stockholm that is home to the world-famous Moderna Museet, the Oriental Museum and, as its name implies, various majestic sailing vessels. A public audience of over 1,500 gave the Company their riveted attention as the dancers presented “the anyones ballet”, “Used Car Salesman” and “Mother Goose”. The evening sun bathed the entire performance in amber light, which provided a completely unique dimension to the choreography and emphasized every nuance of emotive and physical output by the dancers. Before the performance, the dancers were treated to a pre-show reception hosted by Citibank and the American Embassy at the stately residence of Ambassador and Mrs. Charles Heimbold. They were even ferried by boat to the venue! 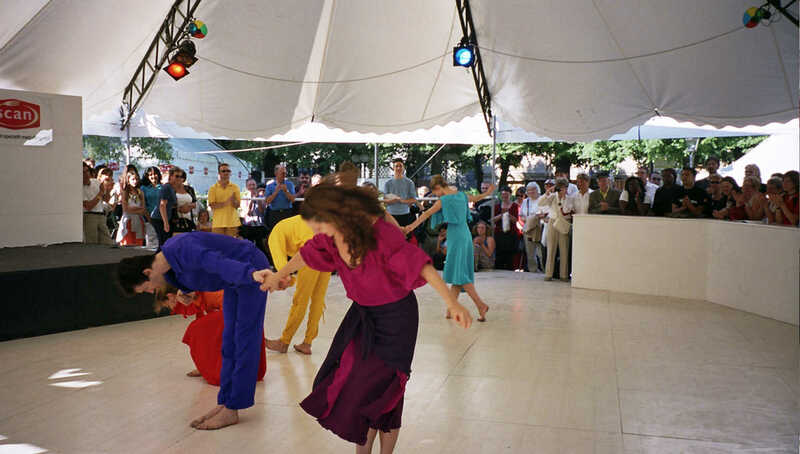 Afterwards the Performance the dancers were feted at the debut party of “Life as a Boy”, meeting Hugh Grant, and tasting of the Mid-Summer magic spirit of Stockholm. 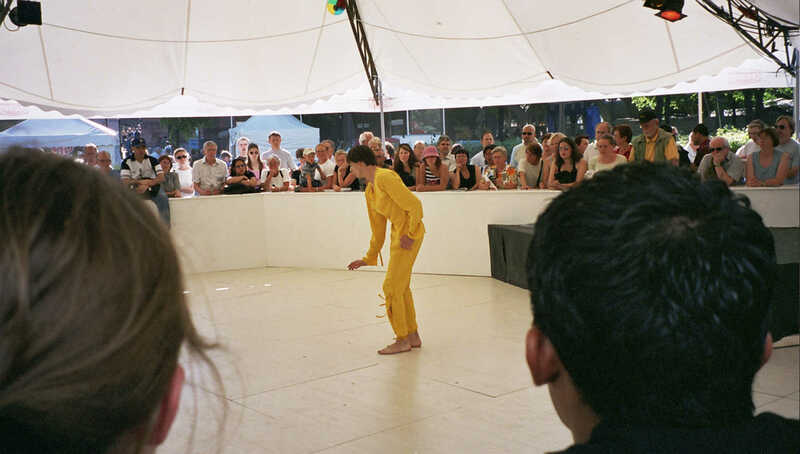 On the third day of BDC's Stockholm visit, the company unveiled its Solo Project in a white tent complete with blonde wooden dance floor (this is Scandinavia, after all) in the bustling center of the King’s Garden. Several hundred on-lookers, ranging from little children to senior citizens, formed concentric rings of a perfectly courteous and approving audience in the round. The deep colors of BDC dancer Katrin Schnabl’s solo costumes (Maurizio in golden yellow, Adrianna in fuschia and burgundy, Tadej in forest green, Mariella in turquoise, Kevin in purple and Virginie in flame orange) stood out like bold strokes of paint against the Festival’s white tent, creating an unforgettable image and a perfectly satisfying cap to Battery’s three-day Stockholm premiere. Concluding the trip, a cocktail party at U.S. Public Affairs Officer Viktor Sidabras’ residence on Strandvagen, and dinner at Mariella’s parents Margareta and Bjore Rietschel’s apartment afterwards. It warmed the hearts of the entire Company, including Battery Board Member Robert Anker and his wife Enid. There was a Journalists' strike in Norway the week before Battery Dance Company was to perform at Stavanger Konserthus. Fortunately, a audience of 150 attended the event thanks to the efforts made by Konserthuset. Journalist strikes can happen unexpectedly and at anytime. Asking the performance venue to increase publicity in these instances can help to decrease the chance of a very small audience. BDC dancers Mariella Rietschel and Tadej Brdnik taught two master classes to a full group of students (intermediate level). The classes, which generated an overwhelming interest from the local dance community, helped Battery reach out to the 18-22 year-old audience, and invest in a long-term relation with the “upcoming” dance scene in Stavanger. Siri Dybwik, choreographer and professor at the University of Stavanger, who coordinated the workshop locally, was equally pleased about the outcome of our collaboration, and offered to coordinate more activities for Battery Dance Company in the region in the future. Battery Dance Company brought American modern dance to Stavanger audiences, and presented 3 works by Jonathan Hollander in the Company’s Norwegian debut. The Company received a steady, warm applause at the end of the performance, which looked beautifully executed and produced in the elegant venue. In addition to the performance, Battery Dance Company taught 2 masterclasses to local Norwegian Students. Many of the students also attended the performance at Stavanger Konserthus. Despite an unforeseen and unprecedented journalists’ strike, which harmed good publicity before the event, the performance was attended by over 150 people thanks to the efforts made by Konserthuset. The audience was mainly from Stavanger, but also comprised staff and guests from the Rica Forum Hotel, our local sponsor, as well as VIP guests from Citibank Norway, who especially made the trip from Oslo. The president of Citibank Norway, hosted a reception in honor of Battery in one of the foyers at Stavanger Concert Hall. About 20 Citibank managers and Citibank clients attended, along with all Battery dancers. Mr. Drangsholt invited Sven Van Damme, Battery Dance Company’s tour manager, to make a speech about the Company and Battery’s mission. Citibank was extremely pleased and is looking forward to seeing Battery return to Norway. Alain Fassotte, producer of Carte Blanche, was publicly introduced to everyone at the reception. Battery Dance Company worked and performed here in June 10 -11, 2002. 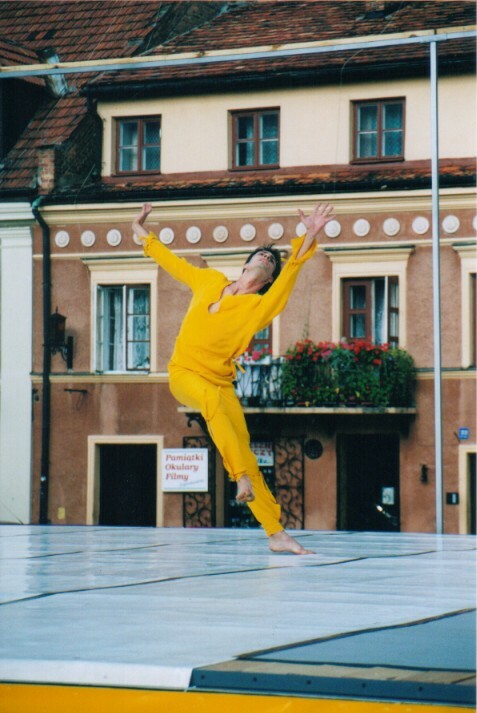 Battery Dance Company’s debut tour of Estonia was built around the concept of showcasing American culture in a very strategic area of the Baltic region: in a country where East and West converge, and where the mission of cultural diplomacy takes on a crucial significance. Battery Dance Company’s first visit to Estonia opened up a dialogue with many new partners, and allowed for true cultural outreach to the country’s people, who had immediately adopted us! The U.S. Embassy strongly supported this project, and facilitated the company’s visit on many levels, including grant monies and logistics. Additional funding was provided by the Trust for Mutual Understanding, The Samuel Freeman Charitable Trust and the SAS Radisson in Tallinn. 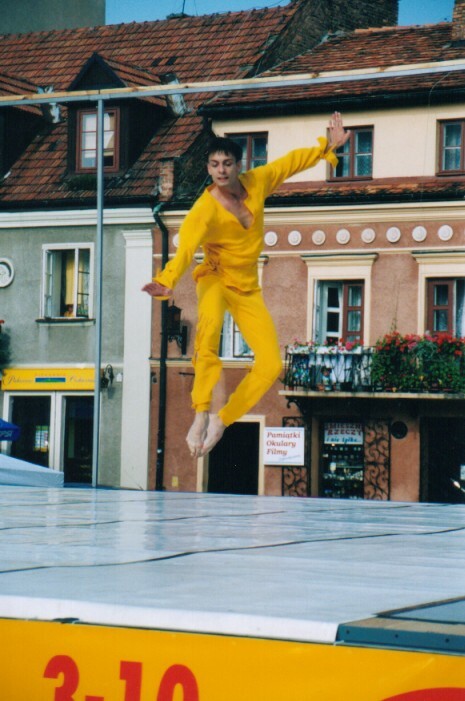 Battery Dance Company’s outdoor presentation of The Solo Project was facilitated by Tiia Hiie, a friend of Jonathan Hollander’s who had served as an interpreter for a variety of international events that took place in Estonia. Tiia negotiated adroitly with local authorities, gaining permissions and arranging for the City to erect a stage in the middle of Tallinn’s medieval main square. On that Sunday afternoon, hundreds of strollers and city visitors stopped by to watch. By the end of the performance, Battery had gathered an audience of over 500 around the stage, and had introduced a new face of American culture to the Estonian public. 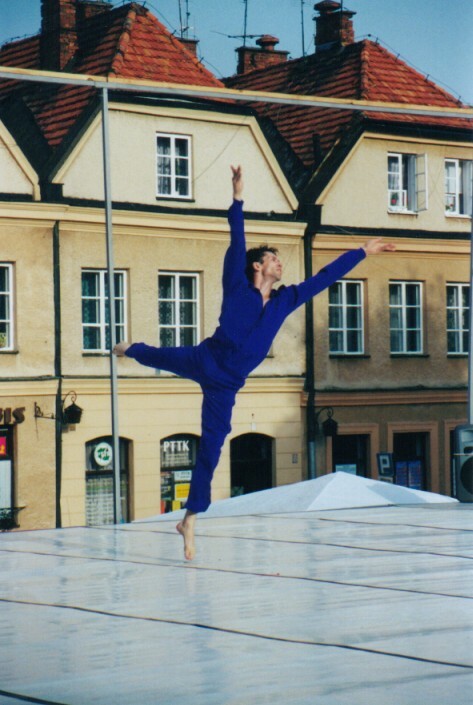 Being in Tallinn provided an opportunity for meetings with members of the local dance community including Priit Raud, first dance presenter in Estonia. By coincidence, the dancers picked the same café for Jonathan’s birthday celebration that was chosen by Paavo Järvi and his colleagues from Estonia’s illustrious clutch of orchestra conductors to celebrate twin sister conductors Anu and Kadri Tali’s birthday the same night. Both groups noticed each other and formed one big joint celebration of performing artists and birthdays! 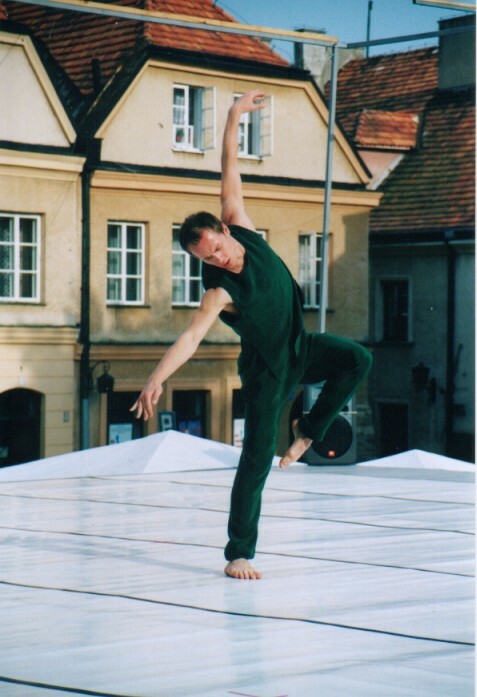 Rakvere, a small town in North-Eastern Estonia, hosts an annual international dance and theatre festival. 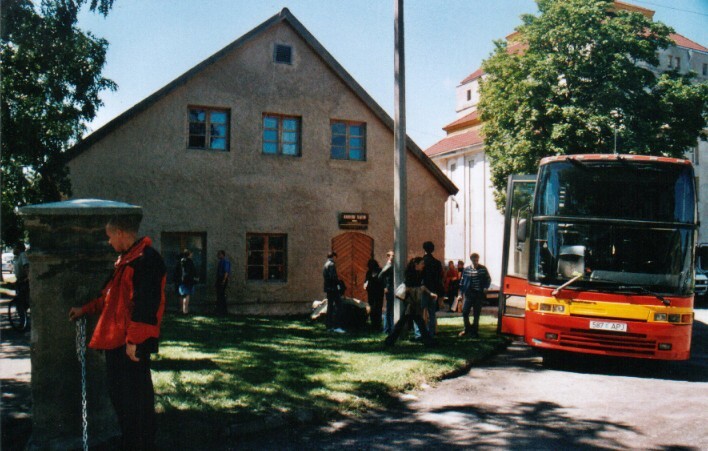 In 2002, Rakvere also celebrated its 700th Jubilee. Battery was honored to perform as part of this historic event. Rakvere’s Von Krahl Theatre was packed “to the roof” and the performance rallied the community from miles around, including local residents, students and workers s to city officials. Battery was given a token of honor, and was thanked for “creating such sweet memories for the city’s Anniversary”.